Mr Hollande said he was convinced the attack was "terrorist-related". After killing an officer, the man attempted to run away while shooting at other officers. Eyewitness: "I heard two or three shots... then there was just panic all around." The gunman who shot dead a policeman in Paris on Thursday has been identified from papers left in his car, but French officials are yet to release his name. Local media say the 39-year-old lived in the city’s suburbs, and had been seen as a potential Islamist radical. 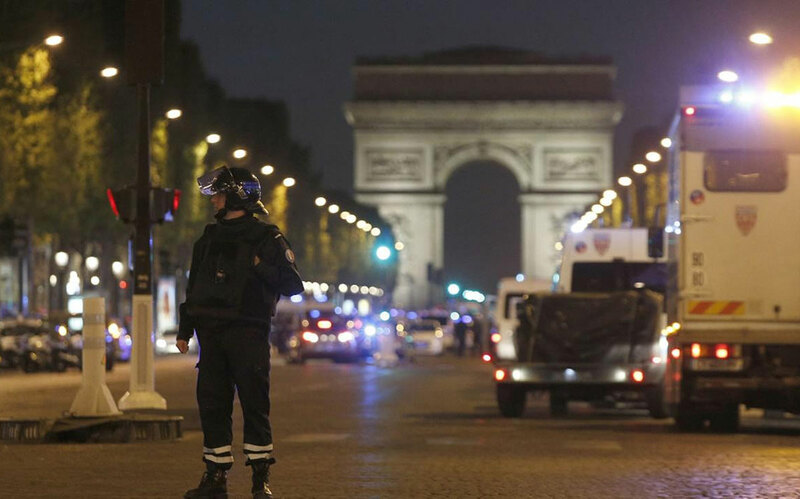 The gunman also wounded two police officers before he was killed by security forces on the Champs-Elysees. President Francois Hollande is to chair a security cabinet meeting, as France readies for Sunday’s presidential poll. Mr Hollande said he was convinced the attack was “terrorist-related”, adding that the security forces had the full support of the nation and a national tribute would be paid to the fallen policeman. So-called Islamic State (IS) said one of its “fighters” had carried out the attack. What happened on Thursday on the Champs-Elysees? A car pulled up alongside a police bus just before 21:00 (19:00 GMT) and a man got out, opening fire on the bus with an automatic weapon, Interior Ministry spokesman Pierre-Henry Brandet said. After killing an officer, the man attempted to run away while shooting at other officers, two of whom he injured, the spokesman added. He was then shot dead by security forces. The whole of the Champs-Elysees was evacuated. Because of its worldwide renown and its large number of visitors, the avenue has long been seen as a potential target, the BBC’s Hugh Schofield in Paris reports. Overnight, a property in the eastern Parisian suburb of Chelles was searched by investigators, who want to know who else – if anyone – may have known about the gunman’s plans. Paris prosecutor Francois Molins said shortly after the shootings that “the attacker’s identity is known and has been verified”. “I won’t reveal it, because investigations and raids are already under way, in particular to establish whether there is any evidence or not of complicity (in this attack),” he said, adding that more information would be released on Friday. According to French media, the attacker served several years in prison for firing on police officers with a gun in the early 2000s. More recently the intelligence services identified him as a potential Islamist radical. Meanwhile, IS identified the attacker as Abu-Yusuf al-Baljiki, in a statement carried by its Amaq news outlet. Could the attack influence the elections? The 11 candidates standing in Sunday’s closely fought presidential election were engaged in a final joint TV appearance to argue their policies as the attack happened. Centre-right contender Francois Fillon also went on Twitter to pay “tribute to the security forces who give their lives to protect ours”. Both Ms Le Pen and Mr Fillon later announced they were cancelling campaign events scheduled for Friday, the last day of canvassing for votes. Independent centrist Emmanuel Macron said during his TV appearance that it was a president’s “first duty to protect” and he expressed his “solidarity” with the police. It would easy to assume that Marine Le Pen – so outspoken about security, migration and Islamic fundamentalism – could benefit at the ballot box. But anxious voters may turn, instead, to experienced conservative politician and former French Prime Minister Francois Fillon. Up until now four candidates were almost neck-and-neck in the lead in the polls with millions of voters still undecided about who to vote for. It’s hard to tell to what extent this attack will affect the election outcome, but centrist Emmanuel Macron and Jean-Luc Mélenchon on the far-left will be all too aware that few see them as foreign and security policy heavyweights. And how did the world react? At the White House, US President Donald Trump said people had to be strong and vigilant. German Chancellor Angela Merkel spoke of remaining “strong and determined” alongside France. Paris shooting: Gunman was ‘focus of anti-terror’ probe. Terrified eyewitness recount scenes of panic as they ran for cover. What is known of the attacker?